JoeBen Bevirt, founder and CEO of Joby Aviation, Joby Motors, and related enterprises, has thought long and hard about the financial costs and lost productivity brought about by the daily automotive commute, a 1.6 hour per day ordeal for many in our urban centers. JoeBen and the Atlantic magazine agree that commuters squander 5.5 billion hours and 2.9 billion gallons of fuel annually, stuck in the fitful despair of slow or unmoving traffic, sharing only frustration and polluted air with their fellow motorists. 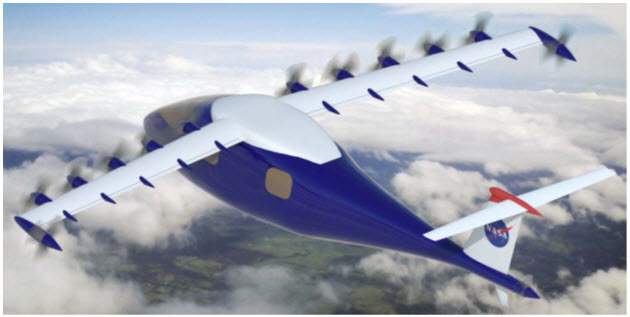 JoeBen told attendees at the April Electric Aircraft Symposium that several years before, he had the seeming pipe dream of moving people by air in a single-seat, eight-motorm, vertical takeoff and landing, electric commuter aircraft that would take one 100 miles at 100 miles per hour for one dollar. The combination of Greg Cole’s Sparrowhawk and electric power focused too much on efficiency, according to JoeBen, and battery technology had not evolved to allow the practical outcome to this dream. With 250 Watt-hour-per-kilogram batteries now a reality, though, JoeBen thinks he can make some magic, creating a two-seat, 12 pivoting motor craft that could carry two people 200 miles at 200 mph for $20. 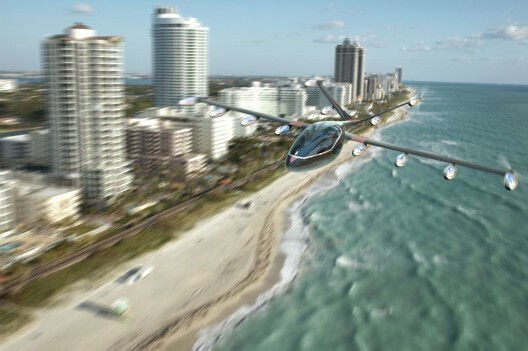 As explained on Joby’s web site, “This environmentally-friendly personal airplane requires 5 times less energy than conventional auto transportation at 5 times the door-to-door speed.” The combination of speed and economy would make this a highly attractive alternative to the daily grind on the ground. The systems seem more complex than the original Monarch, with 12 motors pivoting individually instead of being mounted to one pivoting wing. In “active development,” the S2 has garnered one of Popular Science’s Invention Awards for 2014, with the magazine listing the potential merits of the design. Many of the ideas for this aircraft were tested on a three-propeller machine flown above Joby’s Santa Cruz, California development site. Another outcome of this testing is the Lotus, a long-endurance unmanned aerial vehicle (UAV) inspired by Mark Moore’s Samara. The split wingtip can add span length and lower wing and span loading when fixed in forward flight, but can turn into an upward-facing rotor blade when powered. The neat aerodynamic, robotic and power transition tricks involved can be found in the technical paper by JoeBen, Edward V. Stilson, Pranay Sinha, and lead author Alex M. Stoll, who showed much of the technology to your editor at last year’s AirVenture. Finally, Leap Tech, also developed in conjunction with NASA, has 16 to 20 motors distributed along the leading edge (through varying artist concepts) of its high-aspect-ratio wing, with wide-bladed propeller blades sweeping most of the wing area, and high-lift flaps enabling a coefficient of lift greater than 5 for takeoffs and landings. Even though the combined motors might not exceed 300 horsepower, the four-seat craft could reach 300 mph and cruise at 200 mph at 12,000 feet. In fact, power required for landing is higher than that required for takeoff, according to the charts in the AIAA paper on the airplane, co-authored by Stoll and Bevirt for Joby, and by Mark D. Moore, William J. Fredericks, and Nicholas K. Borer for NASA Langley Research Center. This is probably due to the 40° flap deflection for landing compared to 10° for takeoff, and the need to maintain airflow over a more sharply deflected wing. Computational fluid dynamics (CFD) renderings show the effect distributed thrust has on the wing, allowing only 55 square feet of wing area, compared to 145 square feet compared to a Cirrus SR22. This gives a wing loading of 55 pounds per square foot, over double that of the Cirrus and similar to WWII fighters. Its laminar fuselage has about as little wetted area as practicable, further reducing drag. The high wing loading and sleek shape may work well with higher powered, higher performance derivations of this concept. JoeBen has also actively been working on motors for more conventional ultralight aircraft. Mark Beierle of Earthstar Aircraft has a simpler solution to personal flight, his e-Gull 2000 sporting a new 30-kilowatt motor he designed with Thomas Senkel, a German physicist who also participates in development of the e-Volo multi-rotor craft in Germany and redesigned with improvements by JoeBen. Thomas was the pilot on the company’s first electric multi-rotor machine, proof-of-concept VC-1, balancing atop a “yoga ball” and spinning up the 16 rotors to achieve a one-minute, 30-second flight. Beirele and Senkel first made an 18 kW motor that Mark flew successfully at the Arlington Fly in in 2010, and for several months thereafter. After 35 hours of testing, however, the motor showed signs of overheating at maximum power. A redesigned, 20 kW motor incorporated improved cooling and was able to run for 130 hours and loft the e-Gull to 9,000 feet at full throttle without overheating. After flying the airplane at the Arlington, Washington fly in and AirVenture 2013 after installing a 54 hp. Zero Motorcycle motor and battery, Mark took the Senkel motor to JoeBen, who did a complete redesign. 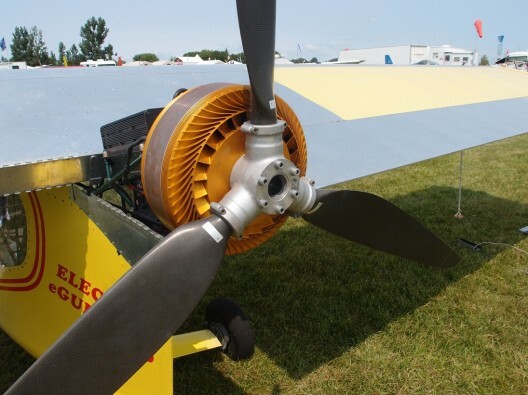 The new, 30 kW motor has improved cooling, is able to climb the airplane at around 500 feet per minute, and seems to have all the characteristics which Mark finds desirable. Joby’s motors are finding multiple uses, with the high number on any one aircraft (except for e-Gulls) pointing toward at least limited mass production.